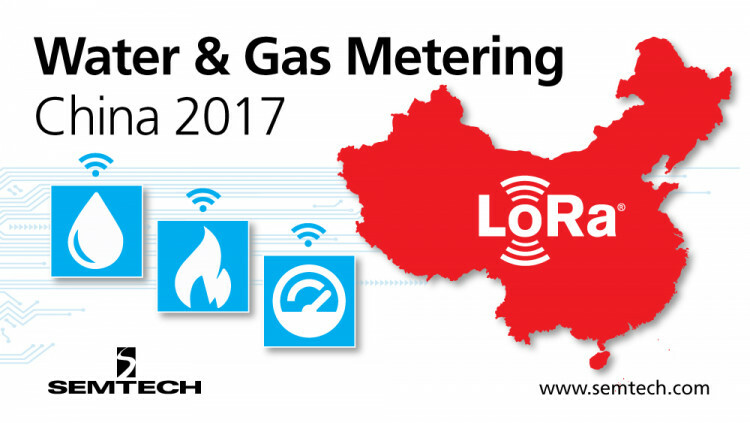 CAMARILLO, Calif., May 24, 2017 – Semtech Corporation (Nasdaq: SMTC), a leading supplier of analog and mixed-signal semiconductors, is exhibiting LoRa Technology solutions at Water & Gas Metering China 2017 from June 22 - 24. The event’s main focus is promoting the digital transformation and technology development in the water and gas utility industry. Focused on the Internet of Things (IoT) connecting the world, Semtech showcases multiple applications incorporating its LoRa® wireless RF technology (LoRa Technology) that can be leveraged in the smart water and gas industries. LoRa Technology enables utility companies to receive information over much longer distances than traditional solutions with a highly-optimized power consumption both with the physical communication layer and the LoRaWAN™ protocol. For water and gas metering, LoRa architecture significantly reduces deployment cost and lower end-node cost due to reduction in battery sizes. In 2016, 348 million smart meters were installed in China, which accounts for 67.1 percent of tracked global installations, and the smart metering market expects to grow more in 2017. Semtech is exhibiting in booth 207. For show information, visit Water & Gas Metering China’s website. Low Power: The LoRaWAN™ protocol was developed specifically for low power and enables unprecedented battery lifetime of up to 20 years depending on the application. Learn how LoRa enables IoT visit Semtech’s LoRa/IoT site. Engage with the LoRa Community to access free training as well as an online industry catalog showcasing next-generation products. All statements contained herein that are not statements of historical fact, including statements that use the words “designed to,” or other similar words or expressions, that describe Semtech Corporation’s or its management’s future plans, objectives or goals are “forward-looking statements” and are made pursuant to the Safe-Harbor provisions of the Private Securities Litigation Reform Act of 1995, as amended. Such forward-looking statements involve known and unknown risks, uncertainties and other factors that could cause the actual results of Semtech Corporation to be materially different from the historical results and/or from any future results or outcomes expressed or implied by such forward-looking statements. Such factors are further addressed in Semtech Corporation’s annual and quarterly reports, and in other documents or reports, filed with the Securities and Exchange Commission (www.sec.gov) including, without limitation, information under the captions “Management’s Discussion and Analysis of Financial Condition and Results of Operations” and “Risk Factors.” Semtech Corporation assumes no obligation to update any forward-looking statements in order to reflect events or circumstances that may arise after the date of this release, except as required by law. Semtech, the Semtech logo, and LoRa are registered trademarks or service marks, and LoRaWAN is a trademark or service mark, of Semtech Corporation or its affiliates.